The purpose of this document is to establish a system for multiple debtors to pay a single workshop transaction. 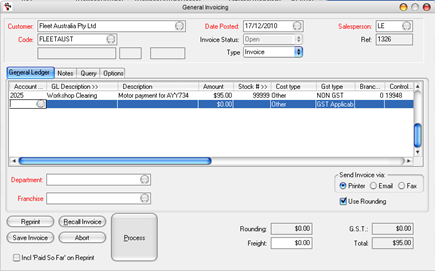 This system has been established for a specific business, however the process is relevant for any business that have multiple payees for a single invoice. -that will act as the expense/holding account for the workshop jobs that you perform. Note: Until the separate invoices are paid by the responsible parties for the work that you do, the money will be held in this particular GL account. Below is an example of an account setup that would suffice, and with this type of setup the account would also appear on your Balance sheet report. 2. 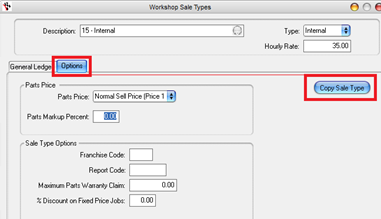 Create a specific Workshop Sale Type for the jobs. Find the Sale Type called ‘Internal’ or one similar that is set as your internal sale-type. Note: By default the database should have one already setup. Hit the Copy Sale Type button (below, left picture). Note: This will copy over all the Labour/Parts/Warranty/Sublets GL account allocations from your internal sale type so you don’t have to re-select them (below, right picture). Change the Description as per below-right, and change the Expense account to your GL account you created before. 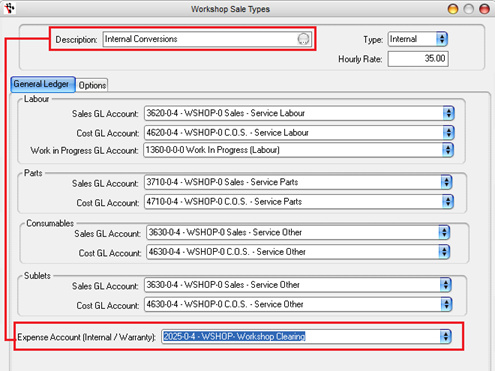 Note: This will allocate the workshop jobs into the holding account whenever that sale-type is used. Do the rest of the Workshop Header info like Date/Advisor/Drop Off Time as per normal. Once this is done Finalise your invoice. 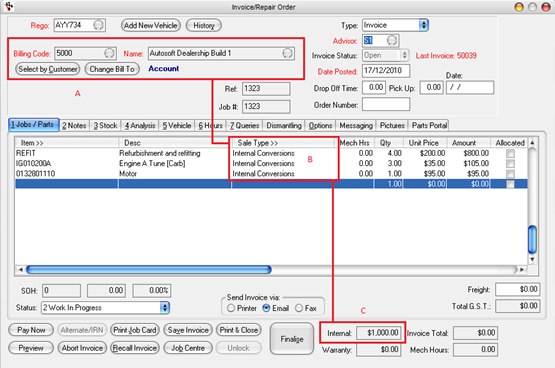 It is now ready to be billed to the separate parties paying for the separate components of the invoice. Check out the corresponding entry to the workshop invoice that you have just done as per below. Note: You will be using that control number when creating your subsequent invoices. In the case below, the control number is 19948. 5. Do a General Invoice. Go to General Ledger - General Invoice. First Invoice is for the ‘Refit’ entry from the workshop invoice we created above. 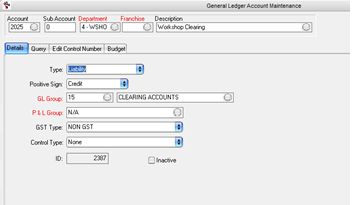 Note: the GL Account eing used is the account we created that now has the workshop invoice amount ascribed to it. The control number (far right column) is the 19948 we saw in the GL Account query. 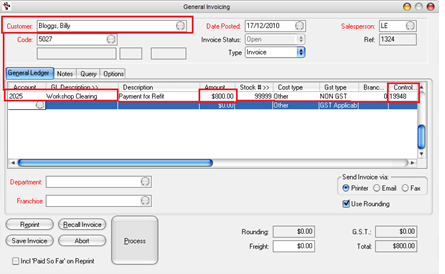 General Invoice 2 is for the second line entry on our workshop invoice. 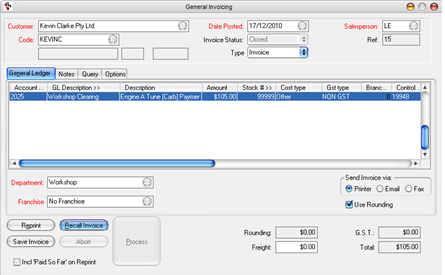 General Invoice 3 is for the final line of the workshop invoice. So now all our invoices have been drawn up, and back in our GL account query for the account we created at the start of this example, the breakup of that job is allocated and the GL account is in balance. All these are linked directly via this Control number, so make sure the control numbers for these transactions all match (ie 19948 in the example below). If the control number for any of the transactions is incorrect, don’t worry as you can edit it in the Edit Control Numbers tab. If the debits and credits match for that account, the outstanding payments have all been fulfilled.